NEW YORK -- The premiere of a virtual reality short by Oscar-winning director Kathryn Bigelow was already a high-profile event at the Tribeca Film Festival on Saturday night. And then Hillary Clinton walked onstage. Clinton was an unannounced panelist, there to discuss the scourge of elephant poaching - the subject of Bigelow's eight-minute film "The Protectors: Walk in the Rangers' Shoes," about park rangers trying to save elephants in Garamba National Park in the Democratic Republic of the Congo. She spoke about her work to save elephants from poachers slaughtering them for their ivory tusks, both as secretary of state in the Obama administration, and later with her family foundation, the Clinton Global Initiative. "We've got to bust this market so it can't come back," she said of the illegal ivory market. Before Clinton and the three other panelists were interviewed by Bigelow, the audience donned virtual reality headsets at their seats and experienced - in 360 degrees - what it's like to be one of the 200 rangers fighting well-armed poachers in the park the size of Delaware. The film gives the viewer both the experience of being in the grass and searching for poachers, and up in the air looking down. A wrenching scene shows the rangers arriving at the carcass of a slaughtered elephant. "I realized that there was an intersection between poaching and terrorism, which led me to this project," Bigelow said. 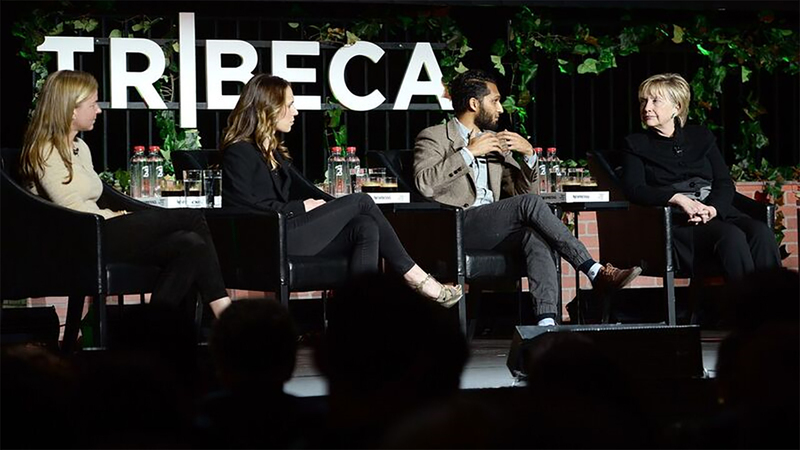 The director of "The Hurt Locker" and "Zero Dark Thirty" directed the short along with Imraan Ismail, a virtual-reality veteran, who also was on Saturday's panel. "They're outmanned and outgunned and they're putting themselves in the line of fire," Ismail said of the rangers. Clinton told the audience that she first became focused on what she called "the horrific slaughter of elephants" when she was secretary of state. "It became clear to everyone that this was not just a terrible crisis when it came to the elephant population, it was a trade, a trafficking that was funding a lot of bad folks, a lot of bad actors," she said. "It was being used to take ivory and sell it in order to buy more weapons, and support the kind of terroristic activity that these and other groups were engaged in." Clinton noted that while China was the biggest market for illegal ivory, the United States was the second-biggest. "So China is going to be a key player but we are, too," she said. The former Democratic presidential candidate noted that Saturday was Earth Day, "and we are marching on behalf of science," referring to marches throughout the U.S. on Saturday. "And part of science is understanding the intricate relationships that we share with all those on this planet and particularly large mammals like elephants, who have a role to play both in reality and in our imaginations," she said. Clinton told Bigelow that her virtual reality film was "so critical, because it is a portal - a portal that people can go into and think about, 'Here we are in New York, what can I do?' And there is a lot that can be done - stop the killing, stop the trafficking, and stop the demand. And part of that is protecting these rangers, who are up against some of the most ruthless killers anywhere on the planet right now, and doing the very best they can." The Tribeca appearance was one of a series Clinton has made lately in New York, including turning up at several Broadway shows, speaking at a recent women's conference, and accepting an award this week from an LGBT community group. Audiences have greeted her with loud cheers and ovations, as they did on Saturday night. National Geographic will release Bigelow's short on May 1 on the virtual reality app Within, and on YouTube and Facebook360 the following week. The film is a co-production of the virtual reality company Here Be Dragons and the film production company Annapurna Pictures.